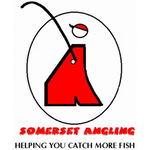 With no Ilminster matches now until May, I booked into the match on Longs today and also phoned Janders who said he’d like to come along as he hasn’t been fishing since last year. Despite it being the first day of Spring, there was still a definite chill in the air as I loaded the car. I picked Janders up and we were soon pulling into the car park, it looked like there was a decent turnout and one of the first people to greet me with a cheery ‘Please go back on the river’ (or words to that effect!) was Adie Bishop. I nearly didn’t recognise him as he was sporting a big, very bushy beard, which just goes to show how long it’s been since I’ve fished here last! After collecting some nets, paying our pools and having a very welcome cup of coffee, it was time to draw. 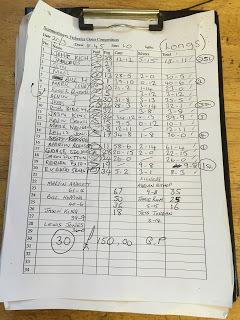 Pegs around 32-34 have been doing well for silvers in the last couple of matches with weights between 12-15lb, I never seem to do very well from that area but I needn’t have worried as I managed to pull out peg 38 in front of the car park which definitely wasn’t in the plan! Pegs 37-39 can be quite good carp pegs but they’re narrow and haven’t got much silvers form – great! 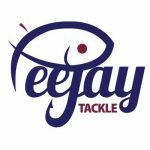 Janders was in a similar boat as he was on peg 21 down the opposite end, another peg that doesn’t seem to be on many silvers anglers wish lists! With it being so cold, I thought the silvers weights would be lower today with 8-10lb probably enough to win. I set up a 10 x 11 MW F1 Slim with 0.10mm bottom and size 16 Tubertini 808 to fish expander pellets and also a Malman 0.4 gram Pencil with an eyed size 16 Kamasan B911 to fish a hair rigged banded hard pellet in case small fish were a problem. On the side tray I had my favourite Bait-Tech 4mm expanders plus some of the new Sticky Method Pellets. They are simplicity itself to prepare, you just put the required amount in a bait box, cover with water for two minutes, drain the water off, let them stand for ten minutes and they are ready to go! I was going to feed three lines with these new micros and I also mixed up some Thatchers groundbait to give me another option. On the whistle I cupped in quarter of a pot of micros at 8.5 metres straight out in front, half a pot at 11.5 metres to my right and a ball of groundbait 10 metres to my left, finally I fed a few micros on the 5 metre line, angled slightly to the left. I started straight out in front with an expander on the hook, after a couple of minutes, the float sunk from view and 2oz skimmer got me off the mark. I missed a bite before the next fish was a 12oz carp then just as I thought I might be in for a good day, the bites stopped! I had a quick look over the groundbait line but no indications and I was back at 8.5 metres, another small carp was followed by a little blade and then I’ve had two good skimmers and a carp in quick succession before it died again as we approached the hour mark. I hadn’t seen a lot being caught, Jason King on peg 36 had a couple of carp as did Bill Hopping on peg 1 but at this early stage I was doing okay. I had a quick look over the groundbait again and this time I had a carp and then hooked a decent skimmer but disaster struck as I was shipping back and it leapt out of the water, shedding the hook in the process. This killed the swim for ages and I only added another little 3oz skimbob over the next half an hour. 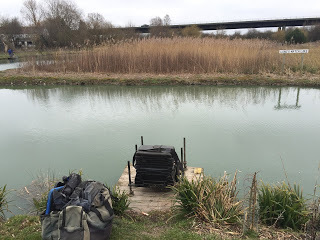 The 8.5 metre line produced another carp but from doing well, I was now really struggling and I had to stop to put my coat and gloves on as it got even colder. I was dripping micros in on the 5 metre line every time I shipped out but wanted to leave it as long as possible before trying it and the same with the right hand 11.5 metre line which I would keep feeding but leave until the last hour before going over it where hopefully a few skimmers would be lined up! I kept alternating between the 8.5 and 10 metre lines but the shorter line was the only place I could really get bites but you couldn’t sit and wait for bites, I’d get the odd carp or small skimmer and then I’d have to rest it again for a bit. After three hours I had a quick go on the 5 metre line but despite trying it on and off throughout the match, I never had a bite there. Glynn Wickham had a wander and reported he was really struggling, he said Roger Russell had a few silvers but it hard going for most and it was looking like my earlier estimate of 8-10lb was a tad optimistic! Bill and Jason were still catching the odd carp and I thought they’d be there or thereabouts. I added a couple more 4oz skimbobs but with time running out, I thought I only had 3-4lb. Then Scotty Russell turned up and while he was stood with me I had a good skimmer of 1.5lb and then next chuck I had one of 6oz or so and started to get interested again with an hour to go. He went to see how his Dad was doing and took his luck with him as my bites tailed off once again. I tried the right hand 11.5 metre swim that I’d carefully fed all day for the first time and yep, you guessed it, I never had a bite there! My next visitor was Ray Wickham and he said that Adie ‘Grizzly’ Bishop was admitting to 6-7lb of silvers and I knew I had nowhere near that, I did add one more 3oz blade before the all out and finished up with thirteen skimmers for between 4-5lb plus seven carp. The scales started with Jason on peg 36 and his total of 39lb 9oz included 4lb 13oz of silvers and he led both the silvers and the carp until we got to Adie on peg 19 whose silvers went 9lb 8oz. Lewis Jones came close with 36lb on peg 17 before Martin Addicot continued his good run and stormed into the lead with 61lb 4oz from peg 11. Bill Hopping weighed 40lb 6oz to go into second place and then I was last to weigh, my carp went 12lb 12oz and then I pulled my silvers net out and Pete called it at 5lb 15oz which was enough for second. 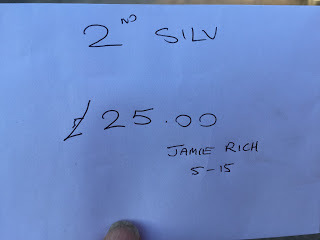 Back at the results I picked up £25 for second in the silvers plus a pound off Janders who didn’t weigh in, I did look around for Glynn so I could collect his pound but he was nowhere to be seen! So it was pretty hard going today but it is still very cold, I’m back again on Wednesday so lets hope the sun comes out then!